I’m on a roll with Francis Mallman. If you haven’t seen his new cookbook, Seven Fires, do yourself a favor and at least check it out of the library. The photos are vivid and mouth-watering. The recipes are not only enticing, but all are pretty easy and best of all, every one that I’ve tried has been mighty tasty. And a lot of them don’t even require a grill. Take this one for example. It’s done in a cast iron pan and cooked over some coals, but no one would have known the difference if I had made it indoors. Except for maybe the smell of bacon lingering long after the meal was through. Maybe then, but that’s in a good, torturing way. This one is simple beyond words, but who would have thought to combine these three simple ingredients in this way. Start with some Tender Beef (filet, tenderloin, rib-eye) cut them into 1′ x 2″ long cubes. Par cook some Thick strips of Bacon in the microwave, then cut them in half. Follow the photos above and either tuck the bacon in at the end or use a toothpick. Pan fry until bacon is crispy and beef is medium rare to medium. 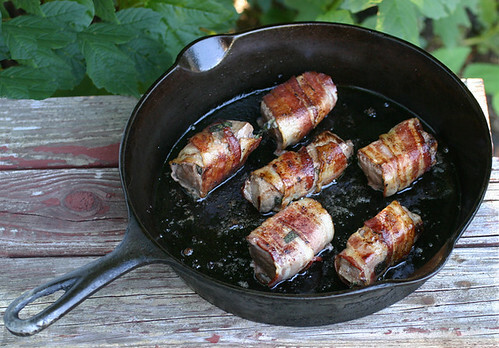 This looks right up our ally…..bacon and steak!!! We will try it soon! That combination sounds great! I have lots and lots of fresh sage, some good steak and a rasher of Chicago bacon. I’m all set!!! Oh, and I voted for you!! WHOA! are you serious? Beef wrapped in bacon??? I’m not sure it gets too much better than that, particularly for us meat eaters. Your photos are gorgeous and (also) mouthwatering….you’d give Mr. Mallman a run for his money. Very lovely indeed! Will try these soon! Holy Shizz – congrats on making it to the next round in PFB! The carnivores in my house would die and go to heaven over these! 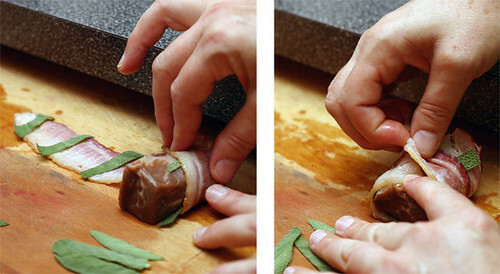 Interesting, it would have never occurred to me to wrap the beef with sage, but once you see it, it just seems so right! This looks fantastic! I must admit, though, it was that beautiful cast iron skillet that first caught my eye. It’s gorgeous!